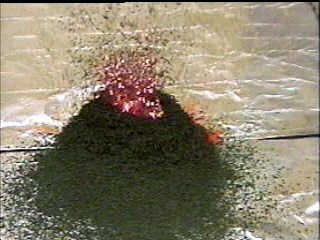 An exciting demonstration volcano can be made with a bit of ammonium dichromate. This is a fun science demonstration that takes almost no time at all to prepare. Place a small quantity (12 to 15 grams, or half an ounce) of Ammonium Dichromate powder on a clay tile. Form the powder into a cone shape. Dim the room lights, and light the top of the cone. The ammonium dichromate will burn fiercely while producing large volumes of a grayish green ash. Small orange sparks will shoot upward a couple of inches. At the top of your model, insert either a 30 ml crucible, a jar lid, or some other flame-resistant container. Coat your volcano model with a plaster slurry to fireproof it, especially near the top of the cone. Place the ammonium dichromate in the fire resistant cup at the top of the volcano, and light it. IMPORTANT SAFETY NOTE: Ammonium Dichromate contains hexavalent chromium, which has been shown to cause cancer in humans and animals. While the risk is extremely low for a one time exposure, many public schools have banned this demonstration for fear of lawsuits. The experiment is safe, however, if you take care not to ingest any of the dichromate compound. The green ash that results from this experiment is safe, and can be discarded with any solid waste. Or, better, mix it with some linseed oil, and demonstrate it as a paint. If any unreacted solid remains after the experiment, it is best to either save it for another demonstration, (but not in the original container!) or dispose of it in fire. Avoid the fumes from this experiment, because it has not been proven safe to breathe them. Please help me improve this website by clicking on the ads. No purchase necessary! Thanks!